Superblend. Super raw ingredients. Immune boosting / antioxidant. Lattes & smoothies + granola + bakes + salads. Plant based. Gluten free. 100% vegan. 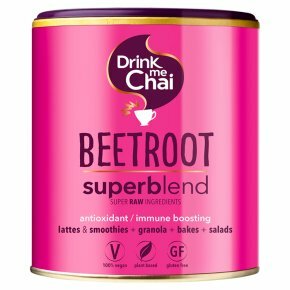 Vegetarian Society approved.Beetroot is rich in antioxidants and high in immune boosting vitamin C. Super healthy beetroot contains compounds that can also help to reduce blood pressure, making this one amazing, super pink, superblend! Beetroot Latte Heat 200ml of dairy, almond, coconut or soy milk. Froth with a whisk or stick blender and add 3 level tsp of Raw Cacao Superblend. Stir well. To sweeten, add a swirl of honey. Beetroot Smothie Blend 1 frozen banana and half a carrot with 125ml almond milk, 2 dates, 1/2 tsp ginger and 2 tsp Beetroot Superblend on high speed until smooth. Pour into a glass, sprinkle with extra beetroot powder and enjoy! Eat Me Our Beetroot Superblend powder makes more than just nourishing drinks... Beetroot Bliss Balls: 30g desiccated coconut, 140g raw cashews, 12 pitted dates (soaked in water), 2 tbsp cocoa powder, 4 tbsp Beetroot Superblend, 1/2 tsp sea salt. Blend all the ingredients in a food processor until smooth but stodgy. Roll into balls, coat in coconut then refrigerate to firm up. Eat within 7 days.